A new millenium - new possibilities. London 2012 saw racing not only on the Mall, but crossing in front of the gates of Buckingham Palace. Crowds in excess of 50,000 enjoyed the wonderful spectacle. A good time to be part of the new generation. GB walks squad pictured in 2007. July 2011 Birmingham. 21 year old British walker, Tom Bosworth pictured shortly after setting a new national 5000m record. London 2012. 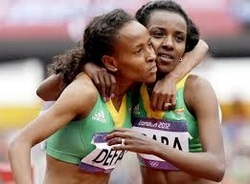 Two of the finest female distance runners of all-time produced a grandstand 5000m finish. Ethiopia's Meseret Defar sprinted past compatriot, Tirunesh Dibaba who then faded to third, behind Kenya's reigning world champion, Vivian Cheruiyot. Dibaba had already won the women's 10,000m the previous week, while 28 year old Defar added another gold to the 5000m one she won in 2004 at the Athens Olympic Games. London 2012. 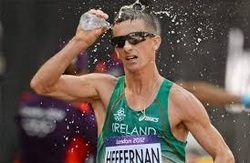 Robert Heffernan tries to stay cool during his epic 50km race walk performance that saw him slice 7 minutes 36 seconds off his Irish record with a 3:37.54 clocking. Feb 2013. 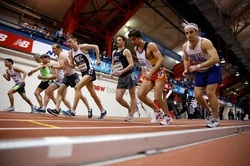 The 106th staging of USA's historic indoor track & field meeting, the Millrose Games. Pictured here is the start of the men's one mile walk. Won by Jonathan Hallman in 6.07.62. The Millrose record is held by Tim Lewis whose super-fast time of 5mins 33.53secs was set back in 1988. 2010 British National track championships. 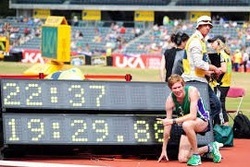 At Birmingham In July 2013 Alex Wright sets a new national 5000m track record of 19 mins 27 seconds. London 2012. Sergey Kirdyapkin did a victory jig on the Mall at the end of his 50km walk. It was hardly a dance of John Travolta proportions, but the 32 year old Russian certainly put on a masterclass of stylish walking to secure his title in a superb new Olympic record time of 3hrs 35mins 59 seconds. London 2012. The early stages of the women's 20km walk. London 2012. Prior to the start of the women's 20km walk, Chris Maddocks commentating as an expert analyst for NBC TV, tipped Elena Lashmanova as the 'one to watch'. The 20 year old Russian duly delivered; setting a new world record, she demonstrated a superb fluent walking action and a maturity under pressure beyond her years. 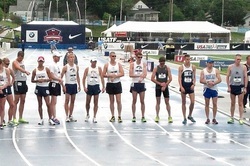 2013 USA Track & Field outdoor championships, Start of men's 20km walk, with Michael Giuseppe Mannozzi, an aspiring 2016 Olympian and friend of Chris Maddocks, in blue cap standing towards right of photo. 2007 AAA's track championships. Johanna Jackson wins the 5000m walk and is seen here flanked by her race rivals. The Mall, London 2012. An iconic picture if there ever was one. 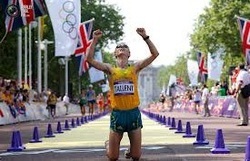 Jared Tallent sinks to his knees at the finish of his 50km walk. The Australian walked a lifetime best of 3hrs 36mins 53 seconds to claim a second successive silver medal at the distance, following on from his success at Beijing in 2008. London 2012. Both men and women's cycle road races started and finished on the Mall. Riders cycled through six London boroughs (Westminster, Kensington & Chelsea, Hammersmith & Fulham, Wandsworth, Richmond upon Thames, and Kingston upon Thames) before racing through Surrey and returning to the Mall. The men raced over a distance of around 250kms while the women did around 140kms. London 2012. The winners podium was not short on glamour when the top 3 female 20km walkers stepped up to collect their medals. Rising star, Elena Lashmanova caught and overtook her more illustrious Russian compatriot, Olga Kaniskina within the final 150m to defeat the defending champion. China's Shenjie Qieyang close up took the bronze.